Clashes between Libyan authorities and Gaddafi loyalists have left 11 dead during the siege of anti-regime bastion Bani Walid. Libyan authorities continue to struggle against multiple militia groups in the midst of growing political disarray. Libya’s President of the General National Congress, Mohammed Magarief, is on the way to Bani Walid to persuade its tribal and military leaders to allow a peaceful army takeover, AFP reported. Meanwhile, some reports suggest that ceasefire has already been agreed, and national military forces are preparing to enter the restive city. Tensions have been rising in the former Gaddafi stronghold as government forces try to bring the dissident town to heal. People from both sides were killed in the violence as militias operating alongside the Defense Ministry faced counter attacks on Wednesday. 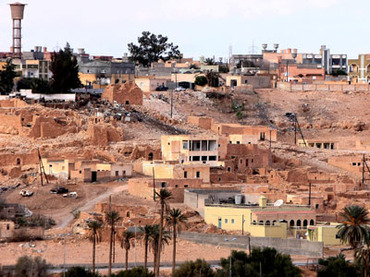 “Bani Walid has been shelled since this morning from three sides – the south, the east and southeast,” Colonel Salem al-Wa’er, a spokesman for Bani Walid’s fighters, told news agency AFP by phone. The commander of ex-rebel group Libya Shield said four of his men had been killed and 19 injured in the battle for the hilltop town. While the deputy director of the town’s hospital said that at least 75 people had been wounded, including a 14-year-old girl. Humanitarian groups have condemned the situation in the town amid reports that residents have been left without food and medical supplies. Amnesty International says hundreds of residents have been unlawfully taken into custody by militia groups in the city and are being tortured and mistreated. Violence erupted after Libya’s General National Congress gave the Ministries of Interior and Defense permission to use force to arrest those suspected of killing Omran Shaaban – the man who is credited with capturing the country’s ex-leader, Muammar Gaddafi, last year. Acting on government orders, troops began to surround the town, threatening to “purge” the settlement of the vestiges of the regime. Army spokesperson Colonel Ali al-Sheikhi told AFP on Wednesday that the military had issued no order to attack the city, while Shield Libya officers said that they had been told to advance on Bani Walid. Libya’s General National Congress has thus far failed to curtail violence in the country and bring militant groups formed of former rebels under control. The country’s fragile government was plunged into disarray when the Congress sacked Mustafa Abushagur, the first prime minister to be elected after the 2011 toppling of Muammar Gaddafi. Abushagur was elected as PM following the attack on the US consulate in Benghazi that killed US Ambassador Christopher Stevens. The now ex-PM warned of rising instability in Libya and called for a “crisis cabinet” to be created. The former leader said he respected the Congress’ decision to oust him, but stressed he wanted to form a “national unity government” with a view to persuading the country’s political factions to end their wrangling and work together. ­Human Rights Watch revealed in a report on Wednesday that stipulates Libyan rebels abused and murdered Colonel Gaddafi, along with his son Mutassim, and loyalists. Sabah Al-Mukhtar, President of the Arab Lawyers Association described the findings as an “embarrassment” for NATO given that they backed many of the armed militia groups that fought against Gaddafi. “The major powers like the US and Britain were all telling lies, to say the least. This revelation, although now documented, is not new, everybody expected it,” Said al-Mukhtar to RT. He concluded that the current situation will remain the same while there are international oil interests in Libya.